At work I was given the task of figuring out at least one method to find some of the domains that were registered by my company’s employees but that we may not have known that they registered. Anyone can visit GoDaddy or PSI or 1and1 and register a domain. We wanted to find out anyone that that registered a domain with an “@MYCOMPANY.com” email in the domain registry. Once I figured out how to do this, I found some really interesting things! 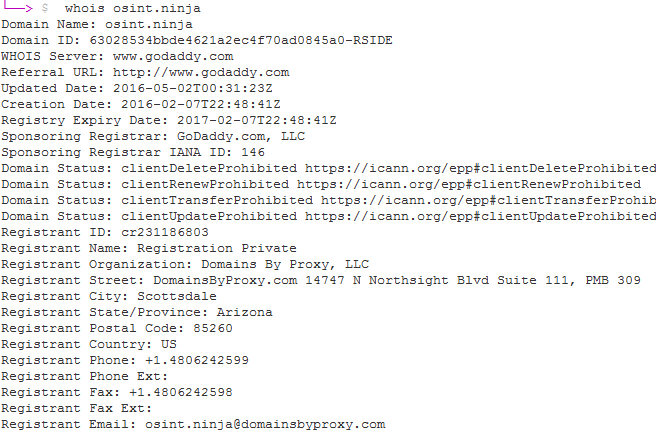 In case you don’t know this, when someone registers a domain name like “webbreacher.com” or “osint.ninja” they use a registrar such as Go Daddy or Network Solutions who then does the work of reserving the domain and tagging it as owned by a certain person/organization. There is some personal or business information that you must provide to the registrar for them to make the registration of the domain you want. Most will want your credit card info first 🙂 and also personal information such as your name, home/business address, phone, and email(s). When you register a domain, many times you have the choice to have the registrar “mask” your personal information that you use to purchase the domain. This is helpful to keep your personal information, well, personal. Instead of using your personal data, the registrar uses their data and then keeps track, internally, who is the actual owner of the domain. For my purposes of finding out what employees are registering domains using our company email address, this masking of their info presents a problem. One of the main tools that people use on unix, linux and Mac systems to look up the registration information about a domain is called whois. From a command line or terminal window, a user can type whois example.com and the registration information for that domain will be returned. This should include names, emails, phone numbers and more…unless the registrant is using the whois masking feature of their registrar. Some caveats here are that whois data is many times stale, old, or just very wrong. Many registrars never check the information that is self-submitted when registering a domain. If I wanted to register insertmydomainhere.info as Barack Obama at 1600 Penn Ave, Washington, DC, there are some registrars that would be happy to take my money. Take whatever responses from whois as suspect data until verified or corroborated with other information. Using whois is great if you want to retrieve the information about a single domain. In my case, I wanted to search ALL domains for any registration information with my company’s email address domain. Using whois for my task, I’d need to request every single domain name with whois and then scrape the results for “@example.com” to complete my task. Laborious if not impossible. The best place I found that had a reverse whois lookup that would allow the searching of whois data using registrant information AND wildcards (such as *) was the viewdns.info site. Let’s show an example using the dhs.gov domain. Using the ViewDNS web page at http://viewdns.info/reversewhois/?q=%40dhs.gov you can retrieve the first 500 hits on domains having the @dhs.gov string in them somewhere. Below are some of the results. This was a huge time saver for me. ViewDNS also has a great API to pull these records down in XML and JSON formats which are easily used in scripts and other programs. So…I was happy and yet confused. I thought that there may be something wrong with the site. Looking at the bottom of the above picture, you can see that fema.net is a domain that has the @dhs.gov string in the registration somewhere. This makes sense since fema.gov is a DHS entity and fema.net is something DHS might register to prevent someone else from registering it and tricking users. But, did you see the farrellswebservice.com and celticwarriorsmc.com domains? Those do not look like DHS domains. Let’s take the farrellswebservice.com domain and do a command line whois on it. Well that solves it. There was no problem with the web site. Under the red arrow is the @dhs.gov email account that the viewdns.info site found: keith.farrell@dhs.gov. I hear some of you saying “So what?” Well, in the world of OSINT we try to tie pieces of data together. Getting email addresses, phone numbers and addresses for people is key to furthering investigations. We can use this data as pivot points (additional search terms to use to find even more information about a target) to augment your OSINT data. 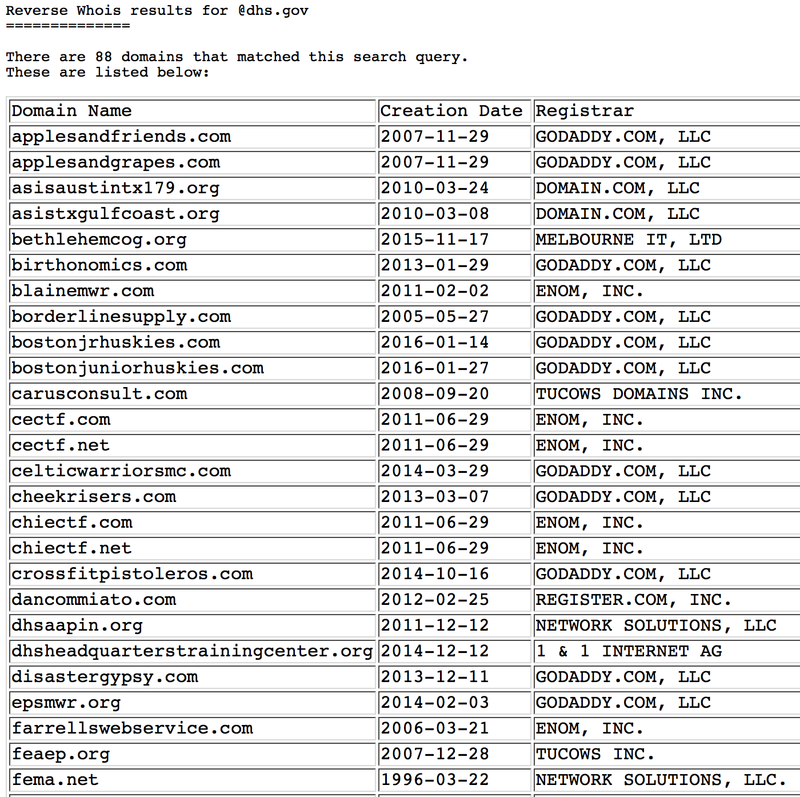 In the above pic for the whois output of the farrellswebservice.com domain, we have all of these pieces. 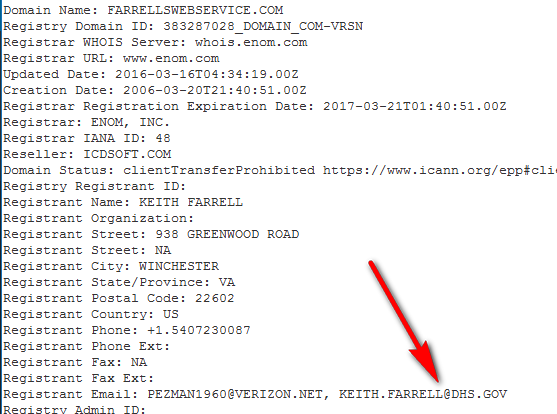 Keith Farrell’s name, home address, phone number, personal and business email addresses are out there in the public for anyone to harvest. So what happened here? It seems like some people use their work emails for personal registrations. While I only use my work email for work purposes, I do know people that use their work email for non-work purposes. We have completed a forward search for domains that have whois data with @domain.tld (ex., @dhs.gov). Kirby (https://twitter.com/kirbstr) noted that we can perform a reverse whois lookup for any of the email results that we obtain from our first search. What we would then do is perform another reverse whois lookup for each of those email addresses to find out what other domains they are registered to. This widens our understanding of what domains (and possibly outside-of-work activities) the people behind these emails are participating in or care about. OK. So we can easily pull up all the domains registered with a certain email domain. Again, so what? Well, what if those domains showed interests of the employees of that company? What if they showed personal information or pictures of a person’s family? In fact, if you visit some of those domains from our results above in a web browser, that is exactly what you get. Check out http://farrellswebservice.com/ and http://bostonjrhuskies.com/. We can also take this data, export it to a CSV (Comma Separated Value) file and import it into a spreadsheet program or visualization app like Paterva’s Casefile (free – http://paterva.com/web7/buy/maltego-clients/casefile.php). Doing that, we can see connections in the data such as all domains registered on a certain date or by a specific registrar. This data can help you determine if a specific domain was registered by the organization and is most likely a work domain or if someone else may have registered it. If you would like to use the ViewDNS API (http://viewdns.info/api/ – You need at least the $40/month level for reverse Whois to work), then I may have a nice script you can use to automate the lookup a domain process. Check out https://github.com/WebBreacher/emailwhois for some code and docs. When I registered that domain, I selected to pay a little additional and have GoDaddy replace my personal information with some generic information pointing to their systems. Anyone having an issue with the domain (or network traffic coming from it) could contact GoDaddy and then they would know to contact me. Additionally, try to limit the places where you use work information for personal purposes especially if that data is or could become public. Like this post? Tweet to me @OsintNinja or @Webbreacher.